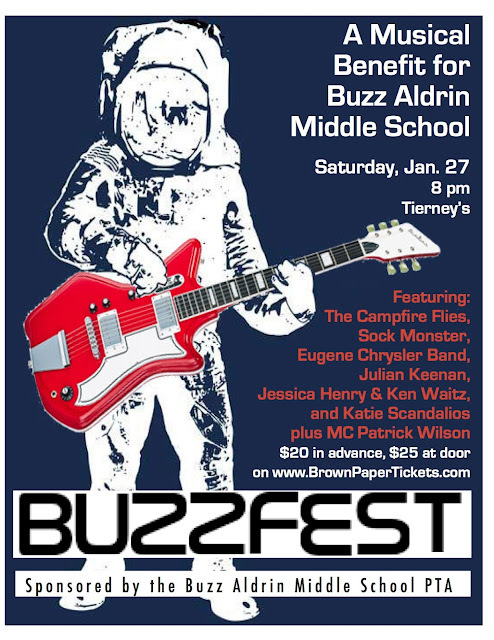 Buzzfest, a rocking fundraiser for Buzz Aldrin Middle School, is coming to Tierney’s Saturday, January 27th. 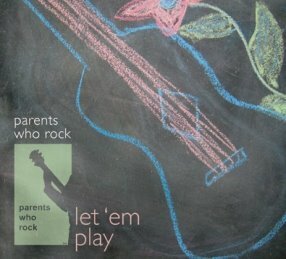 The show features BAMS parent musicians—many of them Parents Who Rock performers—playing with their bands, or solo, all to raise funds for the school’s PTA. The lineup includes Campfire Flies, Eugene Chrysler Band, SockMonster, Julian Keenan, Jessica Henry and Ken Waitz, and Katie Scandalios. Patrick Wilson, a Tony and Emmy Award nominee, and a BAMS dad, will be emceeing the event. Campfire Flies is a collection of six musicians, songwriters, and singers whose musical history in the Garden State stretches back decades. The band features BAMS dad, Matt Davis of the Thousand Pities, as well as members of Speed the Plough and The Cucumbers. This acoustic ensemble performs mostly original music with a smattering of covers that reflect their wide-ranging influences. Eugene Chrysler Band is a trio playing a mix of rockabilly, western swing and Honky Tonk. The band’s live performances pack more wallop than a trucker full of Red Bull and Krispy Kremes, and feature Eugene aka Dan Karlok, flipping his standup base and even playing it behind his back, while BAMS dad Jeff Somerstein keeps the beat. Sock Monster plays a mix of great songs from the sixties through the punk era and the alt. beyond. This quartet of local dads, including BAMS dad JP Uva on guitar, play often around town, and their smart pop with a punk edge is guaranteed to get you up and bopping. Julian Paul Keenan is a solo jazz guitarist who uses looping, samples, and tracks to create a lively performance. He sings, writes, produces and even does brain research on music in his “other job” as a neuroscientist. Jessica Henry and Ken Waitz , a husband and wife duo with a son at BAMS, will kick off the show with a few acoustic duets. Katie Scandalios, is a member of the local mom band, Whatserface, but will be singing a couple of fierce covers from icons like Iggy Pop and the Pretenders, accompanied by Sock Monster. 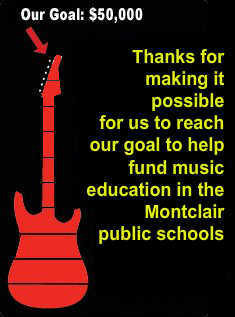 Music starts at 8 p.m. Tierney’s is located at 136-138 Valley Road. Tickets are $20 in advance on www.Brownpapertickets.com, or $25 at the door of the show, if they’re still available! All proceeds benefit the Buzz Aldrin Middle School PTA.